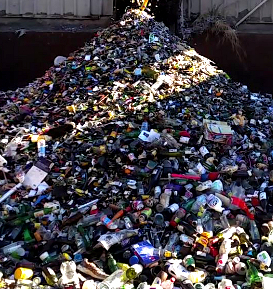 Victorian councils are getting some help from the State Government to deal with China’s waste import ban. The Chinese Government last year announced it would no longer take “foreign garbage” from overseas. Formerly, the country had been contracted to take millions of tonnes of low quality recyclable materials from around the world. The ban covers 24 types of solid waste and requires any future rubbish imports to be processed and uncontaminated material. Following the ban, recycling giant Visy stopped accepting kerbside recyclable waste from 22 Victorian councils. Many have been left scrambling to find a solution as Visy withdraws its services. Prior to the China ban, many councils received a fee from recyclers for each tonne of household recycling. This fee was often used to offset collection costs. The material was then sold to China at a higher price where it was processed. Rather than pay councils for recycling collected from kerbside, the recycling companies plan to charge councils a fee to take the materials. This will leave many councils with unbudgeted costs of more than $120 per tonne. The Victorian Government has now provided a $13 million support package from the Victorian Government to help cover new fees set by local recyclers following China’s ban on certain recycling imports. Mr Rob Spence, Municipal Association of Victoria (MAV) CEO, said he expected the State’s funding would cover part of the increased costs being imposed on councils by the recycling industry until 30 June. “We are pleased the Victorian Government has stepped in with short-term assistance to help ensure recycling can continue to be picked up from households,” he said. “This will assist councils to avoid withdrawing funds from other essential community services to pay the increased recycling fees. “However beyond 30 June, affected councils will need to pass on the new costs imposed by the recycling industry to residents through the waste management charge that appears on rates notices or through the rate for those councils without a waste charge. “The recycling crisis will equate to a rate rise of between 1.1 and 2.5 per cent for ratepayers. This will be on top of any annual rate rise, which cannot exceed the State’s rate cap. “For councils that do not have a waste management charge, we are hopeful the Essential Services Commission will grant them an exemption to increase their rates to cover the new recycling fees. “We anticipate that the impacts of the China ban will be felt by all Victorians. The priority for state and federal governments should now be on significant investment into our local recycling industry to help strengthen our system, and protect jobs and the environment,” Mr Spence said.